PS: The time is not changing cuz it's a static image. PSÂ²: Ignore the country flag and clan name. This is a sketch for another suggestion. - Add different alignment (left, center, right) options for each thing on the interface. - Split the teambox items. So we would have separated items: Red flag, blue flag, red score and blue score. - Add an icon to safe flags/intact in your base/not captured. There's the NOFLAG.BMP, add the FLAG.BMP. There's no reason to have the time counter "hidden" on F1. This is a cruccial info and should be in your face. Disabled by default. This option would help to prepare the match, specially competitive matches where the map starts but some players lose the first sprint. Notice in the video that I'm not restarting the match, just forcing everyone to respawn again. I did a fade transition but It would be coller with the camera interpolation (idk the right name for it). The server would not store any data untill the match starts. Suggested commands: warmup 0/1 and warmuptime #. I wonder why this does not get any attention at all... I really like your suggestions! Looking forward to some dev's feedback. If it's hard to code, we should stop suggesting things here haha. 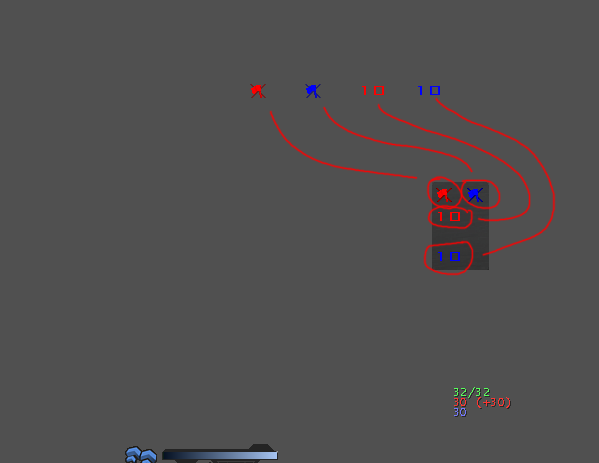 But as they said, the Soldat code is messy, so in this case you may be right. Continue to post good suggestions. The devs do read and consider them. yes for the timer and I guess for the interface stuff but I would disagree with the warmup suggestion. Soldat is a fast paced-game. players like to hop into games real quick without waiting much and just play. For gathers, a warmup does make sense but there's pretty much already a warmup: the time it takes for all players to connect & to be ready. Warmups would only make sense if soldat had a matchmaking system imo. Apart from that, a warmup script should be pretty easy to code, if anyone really wants one on his server. I gave the warmup suggestion cuz sometimes there's a delay and the map does not start at the same time for everyone, just it. The hud is obscuring the view (maybe ok for spec but not for players imho). We don't have a clantag system so that part makes no sense. Features are limited to cw, fw, gathers, not sure how to implement this in a good manner. Thats why I say no atm for this suggestion. Do you agree? I have shown the clan name thing because it's a suggestion for the future and I'm using the same mockup, ignore it. I wasn't suggesting this interface, just presenting a interface that could be made using some things I've suggested. Things with higher priority in that list are: Split of Team Box items http://i.imgur.com/UGUwsVr.png and the alignment of each items. We would be freer to create better interfaces with these options. I think that we are a bit stuck with the Team Box the way it is. The non-captured flag suggestion is something to fill the empty space. Because, if you split the Team Box items and make a horizontal scheme like I did or even in the current scheme, there's a blank space until a flag is captured, talking about the design, looks bad to me. You can see a designed empty space for the flag in Tibres: Ascend for example http://bit.ly/1XudjJe I don't know why there's no flag over there, played it just few times but you can also find screenshots with the non-captured flag (I guess haha) http://bit.ly/1HCmX5w So, my suggestion is 3 flag status: Non-captured, captured and loose flag, where the captured flag icon would blink when the flag is loose on the map. The warmup is useless if you analyze by the normal perspective. Of course that SCTFL, gather players etc don't need this to start the match. I agree that would be useful just for a matchmaking system, adding the ready command etc. The main reason for the warmup suggestion is the delay that makes us lose the first sprint and restart the map over and over. Plus the fact that the match starts right after the map loading and I have noticed this method falling into disuse over the years. Personally I think that starting the map without a countdown is worst compared to games that has a count to start matches. I remember playing Delta Force 1 until 2004 when we were used to set a time (like 3 minutes after the map start) when everybody committed suicide, then the match was started after that. 2005/2006 playing Delta Force Black Hawk Down international leagues but the game had an internal countdown to start the match. Was very usefull to avoid people losing their first sprint. After 2005 I have never played games's competitions without it. So, that's it. F12 on the team score & flags UI change away from the box in the lower right corner, and on having a flashing flag for when it's loose in the map. I think the scores should be centered medially, and then the flag status (all in one graphic location) laterally. F11 on the countdown/warmup idea as a default, definitely.